Four theatre troupes from outside the capital will stage their plays at the National Theatre Festival 2016 today. 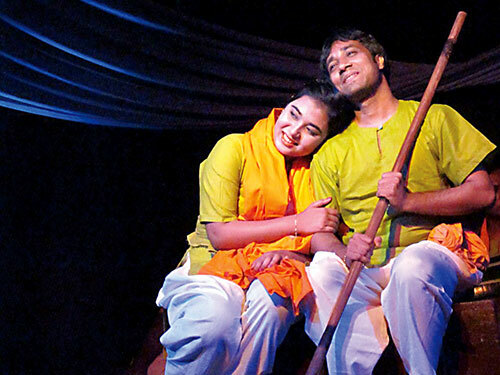 Bogra Theatre will stage Draho at the National Theatre Hall, Darshana-based Anirban Theatre will stage Jishnu Jara at the Experimental Theatre Hall, and Barisal-based Panchosiri Group Theatre will stage Kuhak at the Studio Theatre Hall. All three halls are located at the Bangladesh Shilpakala Academy. Meanwhile, Chandpur-based Barnachora Natyagoshthi will stage Bichchhu at the Dr Nilima Ibrahim Auditorium of Bangladesh Mahila Samity. Bangladesh Shilpakala Academy and Bangladesh Group Theatre Federation have jointly organised the 18-day festival that will feature a total of 58 theatre productions by the same number of troupes from across the country. Saturday marks the eighth day of the festival. Bogra Theatre’s production Draho, written and directed by Taufiq Hasan Moyna, features the struggles of the people living in char areas, suffering from a variety of problems and threats including natural disasters. Jishnu Jara, written and directed by Anwar Hossain, is a social drama that follows a former collaborator of the Pakistan army who, using his political connections, tries to save his son accused of killing the daughter of a freedom fighter. Kuhak, written and directed by Ashik Suman, is an absurdist drama in which the apparent meaninglessness of life has been portrayed through the stream of consciousness of some passengers, gathering at the waiting room of a railway station. Bichchhu, on the other hand, is an adaptation of the French playwright Moliere’s comedy That Scoundrel Scapin. Tariq Anam Khan has adapted and localised the play in which the protagonist, Yousuf, constantly lies and deceives people. He is an arrogant, pompous man who acts as if nothing were impossible for him. However, he knows how to reach his goal using any means necessary. Sharif Chowdhury has directed the play.